Over 30 million American workers are exposed to hazardous chemicals in their workplace. 50,000 or more people die each year because of exposure to toxic chemicals in the workplace. The OSHA Federal Hazard Communication Standard 29 CFR 1910.1200 has become known as the "Right- to- Know" law. This standard gives both employers and employees a right- to- know about the hazardous chemicals they use in the workplace. It is designed to reduce the incidence of chemical source injury and illness in the workplace. High visible and impact polystyrene boards 356mm*508mm Red on White. PVC coated wire racks have a 950mm chain to prevent the binder from being removed and misplaced. 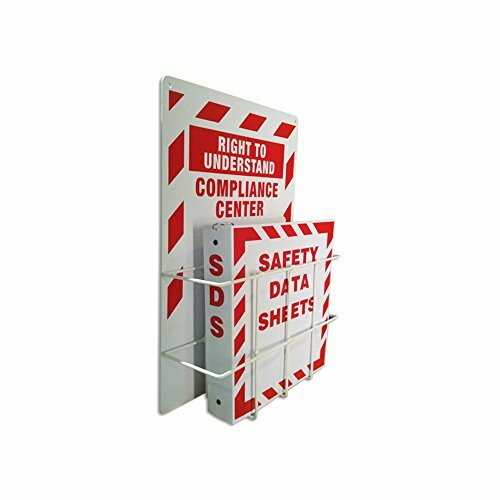 PVC coated steel racks are 350*242*123mm.Designed to hold binders with up to 3" ring diameters. It is designed to reduce the incidence of chemical source injury and illness in the workplace. Satisfies all OSHA marking requirements. Manufacturer: Shanghai Safe-Run Industry Co.,Ltd. Publisher: Shanghai Safe-Run Industry Co.,Ltd. Studio: Shanghai Safe-Run Industry Co.,Ltd. If you have any questions about this product by SAFERUN, contact us by completing and submitting the form below. If you are looking for a specif part number, please include it with your message.